However, a small set of trade-offs in performance keeps it from leaping far ahead of the pack. Despite a revamp late last year, the dust hasn’t settled around HP’s 13.3-inch Spectre x360 just yet. A modest spring update of our favorite convertible gives it perks that first appeared in its revamped 15-inch sibling. Yep, that’s right. If you bought a Spectre x360 even a month ago, you may be slightly aggravated to learn that HP now ships it with active pen support. (A pen even comes in the box as an included accessory.) A 4K UHD option for the screen is available, too. With these additions, the x360 now has every major feature you could want from an ultraportable. The only thing keeping the Spectre x360 from rising even further above its peers is the small price you pay for these upgrades—partially in cold, hard cash, partially in performance. 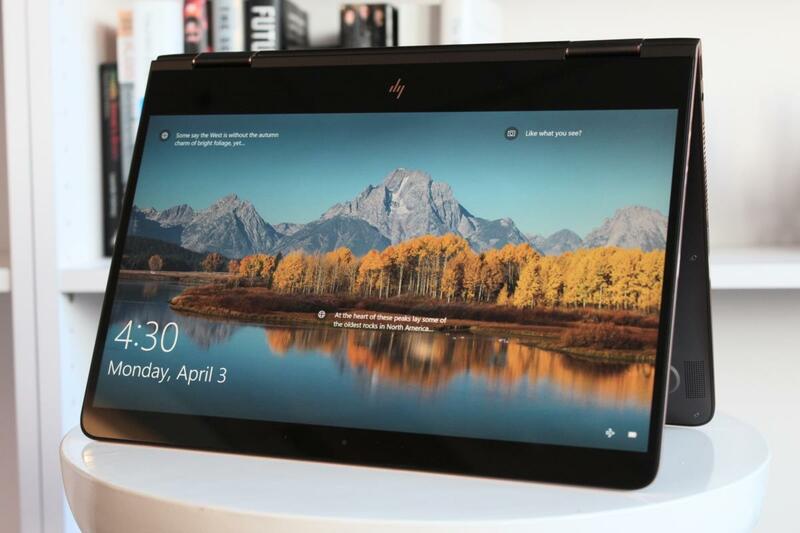 But even without changing its position in the pack, this notebook is still the convertible to beat. The Fall 2016 (right) and Spring 2017 Spectre x360 (left) are virtually the same, save for a few additional features in the 2017 model. First off, it weighs less than three pounds and fits easily inside a bag. It also has a flexible form factor, easily transforming between tablet, traditional clamshell, and other modes. Inside, it packs the fastest processor allowed in this class of laptop—a 7th-generation Intel Core i7 dual-core CPU—with an equally blistering fast PCIe-NVMe storage drive to go with it. On the outside, you get a comfortable keyboard, a pleasant trackpad, and even a set of worthwhile speakers. The Spectre x360 also has a well-placed integrated IR camera that supports Windows Hello and avoids a constant view of your throat in every video chat. And of course, you get a beautifully crisp IPS panel with 10-point touch. That said, there are a couple of changes to note. The 2017 Spectre x360 no longer comes with a USB-C to Gigabit ethernet adapter—instead, you get a pen accessory as your freebie. (You do still get a free sleeve, though.) It also seems to cost a little bit more. Our previous Kaby Lake review unit cost $1,300, but if you configure a system on HP.com with the exact same specs, it’s now $1,350. The specs of our current $1,600 review unit largely mirror that of the previous Spectre x360 that we reviewed: a Kaby Lake Intel Core i7-7500U processor, 16GB of LPDDR3/1866 RAM, a 512GB Samsung PM961 PCI-NVMe SSD, Thunderbolt 3, and a Windows Hello–compatible camera. 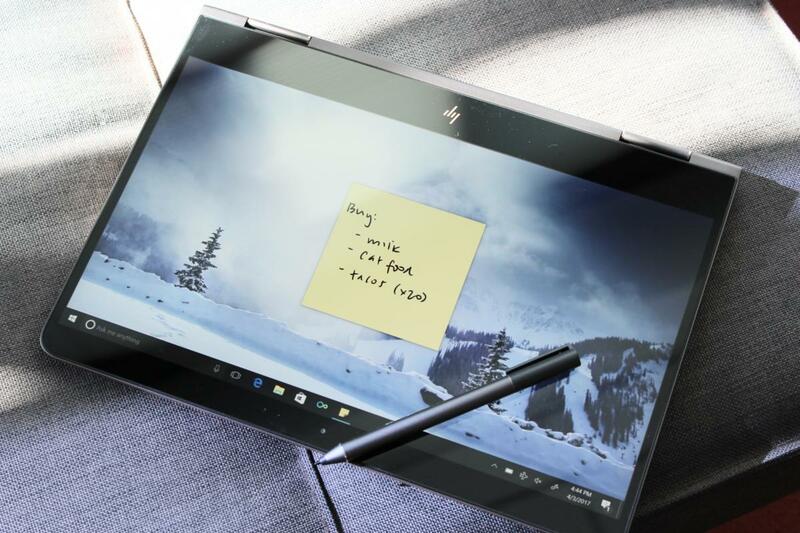 What sets it apart is that 4K IPS touchscreen with active pen support. I’m going to jump straight to what I assume everyone wants to know first: What it’s like to use the pen and the 4K touchscreen. As a disclaimer, I’m no artist (as you can see by my penmanship alone), so I’m unable to comment in depth on how well the Spectre handles sensitivity when doing inking, shading, and the like. But I can say that the Spectre x360 works well for taking notes and sketching out rough diagrams. It feels natural, and the results look crisp. Palm rejection did fail me on occasion, but I could tie it to hesitant placement of my hand on the screen. As for the 4K display, it’s gorgeous. So many pixels on a 13.3-inch screen may seem like overkill, but it’s hard not to like all the detail you can see in photos and 4K video if you work with (or view) them often. Overall, the panel is crisp and fairly bright, with a max output of 340 nits. Of course, with a 4K display comes a performance trade-off. Surprisingly, the Spectre x360 showed dips in areas beyond what we expected, though those did little to affect the overall day-to-day experience. First, the facts. A 4K touchscreen drains a lot more battery than a full-HD touchscreen. More pixels require more juice. For our video rundown test, we first charge a laptop to 100 percent, then set its screen between 250 and 260 nits to simulate the brightness level you’d use in an office. With a pair of earbuds plugged in and the volume set to 50 percent, we run a 4K video file (the open-source Tears of Steel) on continuous loop in Windows 10’s Movies & TV app until the laptop shuts itself off. As you can see in the chart, the difference is pretty dramatic between the 2016 Kaby Lake Spectre and this newer 4K variant. You get almost four hours more with the lower-resolution model—that’s half a workday or a couple of classes right there. The actual runtime, however, isn’t bad by any means: Seven hours is almost a full workday, and it’s definitely longer than a direct cross-country flight. For people who want to live in a 4K world, the sacrifice is one that can be easily lived with. We use PCMark 8’s Work Conventional benchmark to measure performance during the kind of everyday tasks we office drudges do most often—this test simulates activities like web browsing, video chatting, and document editing. The load on a system isn’t particularly heavy, and because this 4K version of the Spectre has the same processor, RAM, and type of storage as our 2016 review unit, we were expecting the benchmark results to be similar. This is where the weirdness popped up. Performance dropped by 18.7 percent—a gap that’s startlingly large, and definitely outside a margin of error. So we ran the test again with the notebook’s resolution set to 1920x1080. That brought us within the expected range, but it’s not an expected result. These days, PCMark 8’s scores haven’t been overly affected by differences in resolution, so there may be a driver issue in play. That said, this difference won’t really affect the experience of using a 4K Spectre x360 for writing email or updating a spreadsheet. Any score over 2,000 in Work Conventional means a system will feel responsive during low-intensity tasks. We ran into a similar story when we fired up 3DMark’s synthetic graphics benchmark. When we loaded Sky Diver to see how the GPU would handle itself, we again saw a gap in performance between the 4K Spectre x360 and other Kaby Lake processors with the same integrated graphics core. Here, the performance delta isn’t quite as dramatic as with PCMark 8, but you can still see about a 9 percent decline when compared to the 2016 Spectre x360. When we dropped the resolution to 1920x1080, that disappeared. In practice, it’s not a matter of concern. Any gaming you’d do on this ultraportable laptop is already limited to less taxing games like League of Legends and Minecraft, and you’d be playing them at lower resolutions and lower image quality to boot. Switching over to tests that focus solely on CPU performance paints a more expected picture. When we ran our Handbrake encoding test, which involves transcoding a 30GB MKV file into a smaller MP4 file using the Android Tablet preset, the 4K Spectre x360 held steady with the 2016 model. On these thin-and-light notebooks, Handbrake is a torture test. We use it to hammer on the CPU and see what happens next: Will the notebook start blasting its fans? Will it instead begin throttling performance to keep it cooler? If a system does lower the CPU’s clock speed, it’ll of course complete the encode at a slower rate. 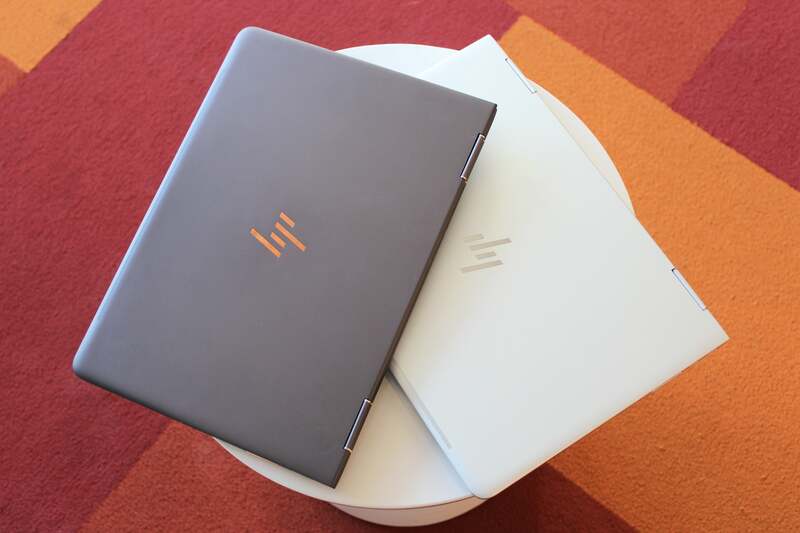 For the Spectre x360, HP favors keeping the system cool. That allows the Dell XPS 13 and its slightly less powerful Core i5-7200U processor to dominate—Dell opts to run its laptop's fans harder instead of lowering the processor’s speed, and the traditional clamshell design means the system can run a little warmer, too. The Spectre, on the other hand, is a convertible, and nobody wants to hang onto a scorching-hot tablet. 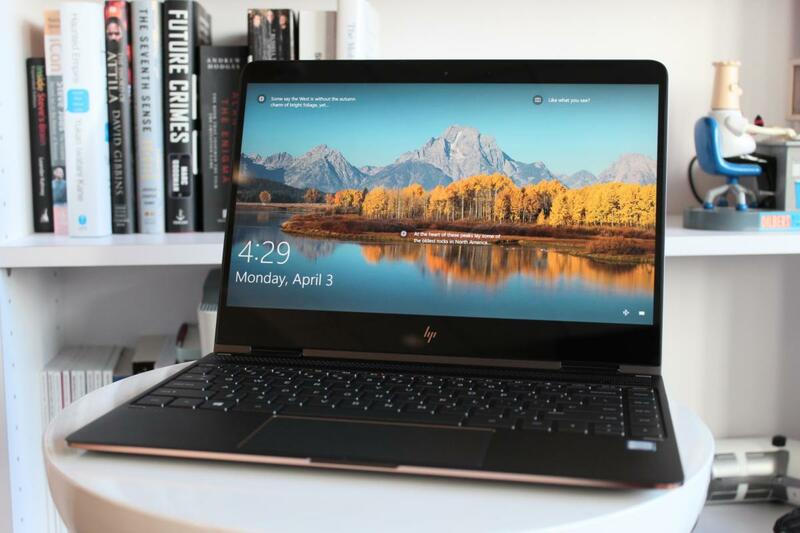 Accordingly, HP cranks down the speed on the Core i7-7500U a little as the processor heats up. During the encode, we saw clock speeds fluctuate between 2.6GHz and 2.7GHz. For our final full benchmark, we pulled out Maxon’s Cinebench rendering test. Like Handbrake, it focuses solely on CPU performance, but its shorter run of just a few minutes helps demonstrate how a system would handle short bursts of activity. When set to test just a single CPU thread, Cinebench gives an idea of how well a laptop would do when running a load that doesn’t tax all of the CPU cores. That covers most tasks that people run on their PC, especially a convertible like the Spectre. Again, no major differences here between the 4K Spectre and its 2016 FHD counterpart. It still sits close to the top of the chart, too. One change we did notice between our 2016 Spectre x360 and this 2017 4K model is the type of SSD inside. Our 2016 review unit came equipped with a Samsung PM951 NVMe M.2 drive, which posted speeds of 1.7GBps for sequential read and 581MBps for sequential write in Crystal Disk Mark 5.02. Just look at the math. If you want a convertible, you can opt for Lenovo’s Yoga 910, which actually gets you slightly better specs but no active pen support. A Core i7-7500U system with 16GB DDR4/2133 RAM, 512GB PCIe SSD, 13.9-inch 4K UHD IPS touchscreen, and fingerprint reader costs $1,500. That's cheaper, but keep in mind the Yoga 910 is also a larger and heavier notebook. If you want a compact convertible with active pen support, there’s Dell’s XPS 13 2-in-1, but you’ll forgo a 4K screen and some performance. The XPS 13 2-in-1 comes equipped with a low-power Core i7-7Y75 processor, 16GB LPDDR3/1866 RAM, a 512GB PCIe SSD, QHD+ (3200x1800) touchscreen, and a fingerprint reader. If you want a pen, it costs an additional $50. Total: $1,850. Pitting the Spectre x360 against our current ultrabook champion, the Dell XPS 13, you’ll pay $1900 for a Core i7-7500U CPU, 16GB LPDDR3/1866 RAM, a 512GB PCIe SSD, and a QHD+ (3200x1800) touchscreen. You’ll also drop an additional $25 for a fingerprint reader if you want to use Windows Hello, and there is no active pen support nor option for an IR camera that enables Windows Hello facial recognition. Specs aren’t everything, of course. You might want longer battery life, or a more compact package, or more ports. But if we had to recommend one laptop to someone who didn’t want to think too much about their purchase and wanted the best of everything, this is absolutely still it.